When I gave a talk at a MOPS meeting a few months ago about style & outfitting, one of the first things asked when I opened the floor for questions was, "So...you said that pattern mixing is a fun trend. But...how do you know what patterns to mix?" For me, I almost always pair a stripe with some sort of floral. It's easy, it's fun, and it doesn't look like a 4 year old picked out your outfit. Whoa. Hey there white & pasty January legs. Anywho, what are your favorite patterns to mix? I've been bitten by the stripes bug. At stores, I am drawn to racks of skirts, shirts, even coats, all wearing beautiful stripes. I've succumbed to the temptation a couple of times but usually just pair them with solids. 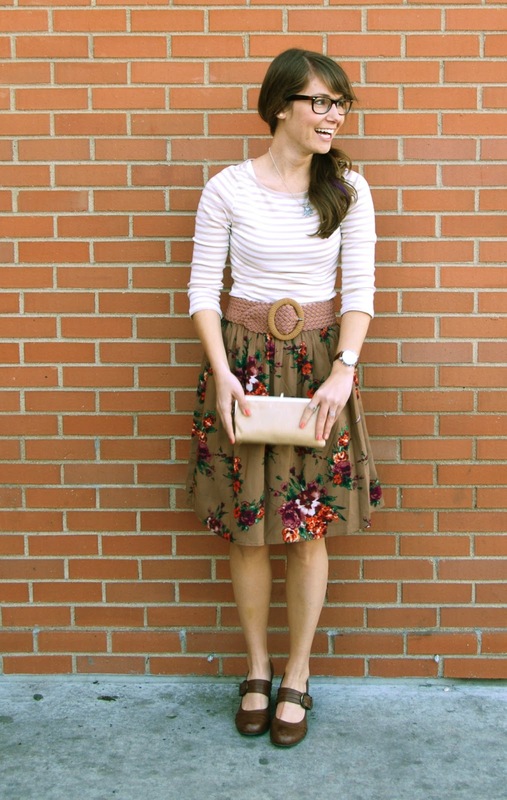 Now I'm thinking that I need to find a floral skirt! this outfit is adorable - you are adorable! : ) hope you have a good day today! You should get a pin it button on every post I really want to pin this outfit!!! And white pasty legs?? You ain't seen nothing girl!! Anywho... I looove this outfit!!! I agree a strip is a neutral and can go with any pattern. I wear stripes all the time with polka-dots. I also love to wear colors that don't match, they brighten up your wardrobe and you look more creative. Ridiculously gorgeous!!! I tried wearing a skirt sunday. didn't happen! i will get there!! But this is such a perfect pairing!!! Also your legs are so NOT white or pasty!!! 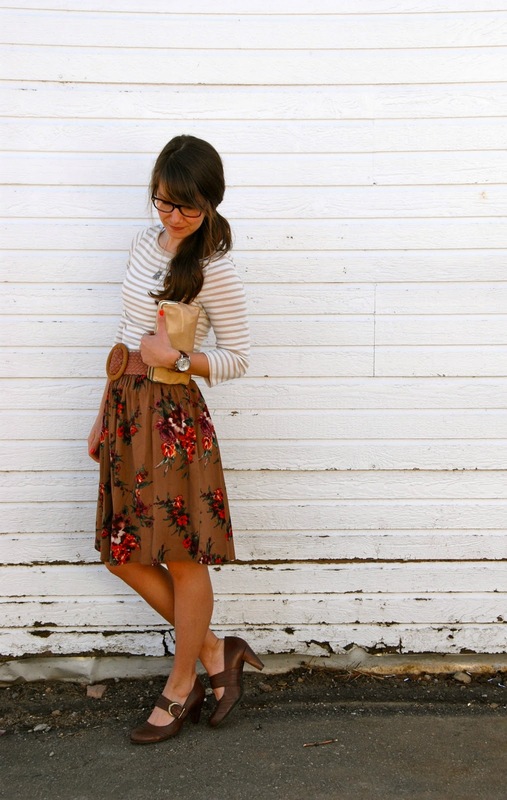 love floral and stripes together!! AHHH you are too cute! oh, i love the skirt and those shoes! and you look so purty in those glasses! Your legs are nothing pasty compared to mine. They haven't seen sunshine in months. Glow-in-the-dark is a better description! Very cute outfit! oh darling, come to the Northwest if you want to see REAL white and pasty legs. yours look tan! :) love the stripes + floral!! If those are your pasty legs, you don't even want to meet mine...You look adorable! Love this outfit! I feautured you over on my blog yesterday! Have a great day! I love the belted skirt...and the pattern mix. Vintage-y and modern! I love seeing the pattern mix. I wish I would think to do it! Fab look mama. LOVE this outfit! LOve the heals too!! Loving your style and your blog. Stopped in from The Pleated Poppy link up, and I'm your newest follower! Hope you are having a wonderful weekend! i love this look... the skirt, the glasses. i love it all!